all work is done onsite. Have a question, let us know! 1. A complete diagnosis is the first step. Each movement in your watch is completely disassembled, examined and restored. 2. Our watch repair masters use 10X magnification to eliminate any chance that something is missed. 3. Each case and bracelet is inspected, detailed and cleaned to refinish and restore your watch to its original factory appearance. 4. Timekeeping and accuracy are all rigorously tested using the latest electronic timing system that simulates actual wrist-wearing. 5. Water-resistancy is calibrated to simulate the needs of each model from 100 to 2,000 feet in altitude, guaranteeing the level of quality and reliability that you naturally expect from a Rolex watch. 6. When you pick up your watch we’ll show you the best way to manually wind it before wearing it for the first time following our service. As an added security measure, your watch is also logged in our data system, linking the serial and model identification to your name and contact information. Our watch repair service ensures that every timepiece leaves our care having met or exceeded its original function and appearance specifications. We invite you to stop by and talk with one of our certified watch-masters about your next service. 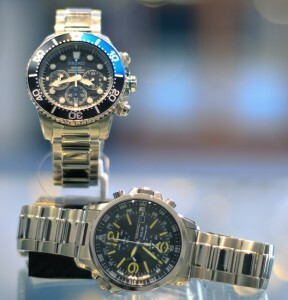 Need a Watch Repaired? Click Here. Need Jewelry Repaired? Click Here. Need a Clock Repaired? Click Here.